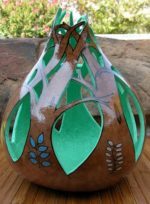 Victoria learned traditional southeastern woodlands style pottery making seventeen years ago from her mother, Anna Sixkiller Mitchell, a full blood Cherokee, who revived the art for the Cherokee Tribe of Oklahoma over the last 40 years. Although Victoria didn’t begin showing and selling her pottery until 1998, she says, “I feel as if this is what I was meant to be doing, I love digging the clay, creating something new and carrying on the tradition my mother started.” She specializes in re-creating early mound builder and Eastern Woodlands style pottery. Victoria teaches pottery workshops for Cherokee, Creek, Miami, Quapaw tribes in Oklahoma and has given workshops at the Smithsonian Renwick Gallery, University of CA, at Davis and for private groups. She continues the research her mother started by visiting museums, mound sites and avidly reading and collecting books on Indian history and arts. In September 2005 she was awarded a Smithsonian Native Arts fellowship from the National Museum of the American Indian which included travel to and research at many museums in Washington, D.C., Philadelphia, Boston and NY City. Currently her work is being exhibited at the National Museum of the American Indian, 4th floor, Smithsonian Mall. She has several works in the permanent collection of University of Arkansas, Little Rock. She sells her work at Dept. of Interior’s Indian Craft Shop in Washington, D.C., Buffalo Sun in Miami, Oklahoma and directly from her home studio in Welch. She has won awards for her pottery at Santa Fe Indian Market, Eiteljorg Museum Indian Market, Indianapolis, Cherokee Homecoming Art show, Tahlequah, OK, Five Tribes Museum Art Fair, Muskogee, OK, Indian Summer Festival, Bartlesville, OK and recently won Best of Division-Pottery at Red Earth Festival, Oklahoma City, OK, in June 2007, and in August 2008, won First in Traditional Pottery at Cherokee Homecoming Art Show, Tahlequah, OK.
Victoria credits her success as a potter and teacher of the art to the Lord and her mother’s patient help over the years.